It doesn't matter whether it is wartime or a natural disaster has struck, our Guardians of The Sky are always there for us. Over the years, the IAF has carried out various operations in both Indian and foreign land whenever required. Having some knowledge about these operations can give you an extra edge over other aspirants in SSBs. In this article, we will have a look on various such operations. The Annexation of Goa was the process in which the India annexed the former Portuguese occupied Indian territories of Goa, Daman and Diu. It was code named Operation Vijay by the Indian Armed Forces. It involved air, sea and land strikes for over 36 hours. It ended 451 years of rule by Portugal over its remaining territories in India. The Indian Air Force carried out many small missions in both Goa and Daman & Diu ranging from fly-byes, destroying targets, dodging anti-aircraft guns, destroying mortar positions, clearing covers for the Army, to various air attacks. It was an aerial operation of Indian and Bangladeshi allied forces during the Bangladesh Liberation War in 1971. It took place on 9 December 1971. It played a major role in India's victory in that war. The Indian Air Force airlifted the Mukti Bahini and the IV Corps of the Indian Army from Brahmanbaria to Raipura in Narsingdi over the River Meghna, bypassing the destroyed Meghna Bridge and Pakistani defences in Ashuganj. The Meghna Helibridge along with the Tangail Airdrop on 11 December ensured that these Pakistani defence positions were by-passed, capturing the approaches to Dhaka. It was a follow up operation to the Meghna Heli Bridge operation. It was launched on 11 December 1971 by the 2nd battalion of the Indian Army's Parachute Regiment. The main objective of the operation was to capture Poongli Bridge on the Jamuna River to cut off the Pakistani 93rd Brigade which was retreating from the north to defend Dhaka and its approaches. The IAF carried out fake drops using dummies dropped from Caribou aircraft to hide the true location and extent of the operation. The Indian Air Force dropped paratroopers in the capital city of Male and they immediately secured the airfield and restored the control of the capital city within hours. On April 25, 2015 Nepal was struck by an earthquake. IAF launched a rescue operation code named Maitri. It is till date the biggest ever Disaster Relief Operations of The Indian Airforce in a foreign land. Total 1636 sorties, amounting to a total flying effort of 863 hours were made towards air evacuation. Around 780 casualties including 121 foreigners were airlifted. Also more than 5000 people alive people affected were provided with some sort of help. 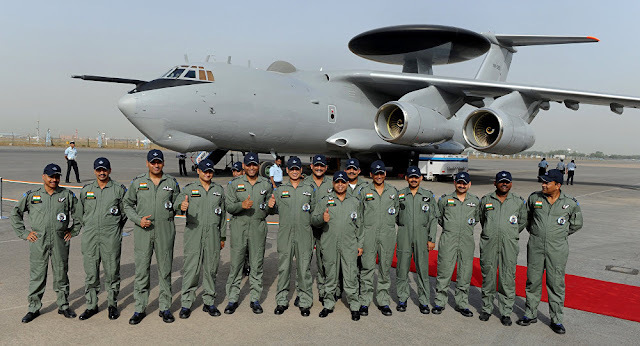 It was an operation of the Indian Air Force to evacuate Indian citizens and other foreign nationals from South Sudan during the South Sudanese Civil War. It was launched on 14 July 2106. There were around 600 Indians in South Sudan. Around 450 were in the capital city of Juba and others elsewhere in the country. The Indian Air Force deployed two C-17 Globemasters to evacuate them. The Minister of State for External Affairs, General VK Singh also flew to Juba. The first flight left Juba on 15 July (South Sudan Time) carrying 143 individuals including 10 women and 3 infants. It landed in Kerala on 16 July.